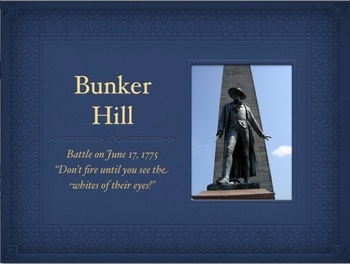 This is a 1024 x 768 QuickTime slideshow about the Battle of Bunker Hill and the monument. You click to advance the slides, and there is a script or notes with slides in pdf for you to print out to help with your presentation. There are 65 slides. 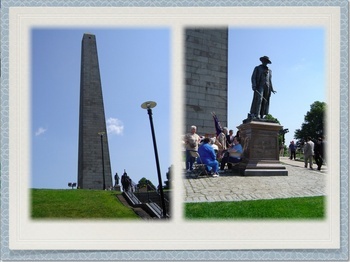 Most have actual photographs that I have taken on my visits to Bunker Hill and Boston. Includes photos taken on Bunker Hill Day 2008. Great to use with a projector or on an Interactive Whiteboard such as a Smartboard or Promethean Board. The sample is much smaller in size than the actual slideshow, but it does contain all of the slides. And the thumbnails are also at a lower-resolution than the actual slides. You must use Apple Quicktime to run the slideshow.